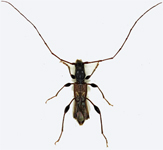 Longhorn beetles, the common name for these insects, refers to the very characteristic antennae which are usually long although it must be said that in many species they may be short e.g. Phymatodes and sometimes barely reach back beyond the base of the elytra. Usually filiform but occasionally serrate or pectinate, they arise from tubercles on the front of the head and can be reflexed back over the thorax and elytra (cf. Chrysomelidae). Generally elongate and somewhat depressed species with the elytra broader than the thorax, often very much so. Eyes large and notched to accomodate the antennae. Legs long with all tarsi pseudotetramerous; fourth segment tiny and third strongly bilobed. Elytra never regularly striate or with rows of punctures and often pubescent. Around 60 species are listed as British but others are occasionally imported in timber. Cerambycids usually live in wood, some are monophagous while others are more general feeders, some attack herbaceous plants e.g. Phytoecia and Agapanthia. In the UK their commercial impact is negligible as most larvae feed on rotting or fallen timber and in this respect they may be considered beneficial; old stumps are rapidly broken down by e.g. Rhagium or Arhopalus. Hylotrupes can be a nuisance as its larvae develop in the structural timber in houses. Many species feed as adults, Laminae feed on stems or leaves while Lepturinae are often seen on flowers feeding on pollen. Some are usually nocturnal e.g. Prionus and come to light. Copulation occurs on flowers or in the host plant and eggs are laid in bark crevices, cracks in timber or old burrows, in herbaceous stems or sometimes in the ground around the host. Egg cavities are sometimes excavated with the mandibles or holes bored with the ovipositor. Larvae attack wood of all sizes and are often remarkably resistant to dessication or waterlogging. This stage generally takes 2 or 3 years, rarely less, but in cases where they live in seasoned wood this can be prolonged to five years or longer; adult Eubria have emerged from furniture years after the timber was imported. Pupation usually occurs under bark or in the outer layer of xylem, sometimes in the soil in earth cocoons. many pupate in the autumn and overwinter as adults within the pupal cell. Many species e.g. Prionus, stridulate when handled and some produce characteristic scents e.g. Aromia and Agapanthia which can be a guide to their presence. The works by Joy and Duffy work well with our list but several species are omitted, the more recent work by Bily and Mehl is more comprehensive, excluding only Anoplodera rufa which was recorded once in 1860. A large number of foreign species have occasionally been introduced but are not established, many of these are described by Hickin, see also Hinton H.E. 1948 Ent. Mon.Mag 83:284-289. The series of papers by Kaufmann, R.R. Uhtoff- in the Ent.Rec J. Var. between 1987 and 1992 should be consulted for the status and some coverage of the ecology of many of our native species.